Goulding will take the stage at London's Roundhouse on Sept. 19, with a special guest to be announced. Underwood will follow on Sept. 21, while Mumford & Sons will be joined by Jack Garratt on Sept. 27. Apple also announced that both Lion Babe and NAO will join Disclosure's set on Sept. 25. 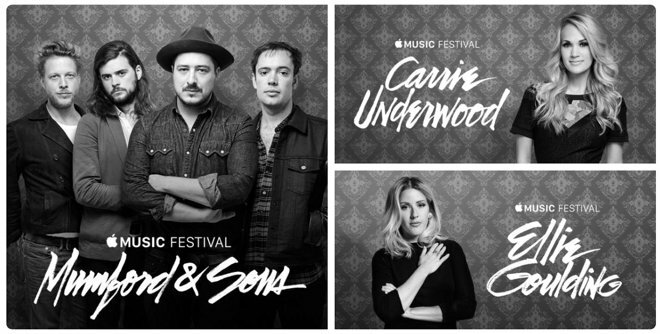 All 10 headline acts for the Apple Music Festival, formerly known as the iTunes Festival, have now been announced. Special guests still remain unknown for half of the acts, however. Beats 1 will provide coverage of the festival when it kicks off later this month, while fans can follow a special Apple Music Festival page on Connect for lineup updates, announcements and behind-the-scenes photos and video. Like the former iTunes Festival, Apple is handing out tickets through media partners in the UK, which this year includes the London Evening Standard. Those who can't make it in person can stream the festivities live via Apple Music or iTunes on iPhone, iPad, iPod touch, Mac and PC. Apple TV owners get direct access to high definition set replays, though there has been no word on live performances.